The notion that the black cats of parts of northeast Scotland are hybrids between Scottish wildcats and domestic cats is not controversial. The idea that they represent a hybrid species is, however, not something that has been considered. These black cats were anomalous, and during the tabloid-soaked years of the 1980s and 1990s, they became sort of legendary throughout Britain. Eventually, some analysis was performed on some specimens, and it was decided that these animals represented hybrids between domestic cats and Scottish wildcats. At the time, these two animals were considered different subspecies but belonged to the same species. Since that time, a new revision of felid taxonomy has been proposed in which the European and Caucasian wildcats are placed in one species (Felis silvestris) and the species that gave rise to the domestic cat is now called Felis lybica. I generally agree with this new taxonomy, because of the deep division molecular division between these two cats, but I think that the domestic cat belongs as as part of Felis lybica in the same way dogs are part Canis lupus. If one adheres to this revision and accepts my little critique, then the so-called Kellas cats represent a hybrid species. It would be great if more molecular studies were performed on these cats, but cats don’t seem to get as much fanfare or funding as dogs do when it comes to these sorts of studies. I should also note that the Scottish population of European wildcats has significant introgression from domestic cats, so much so that in past 30 years, no Scottish wildcat DNA samples have shown to be free of domestic cat genetic markers. This ecotype of the Lybica wildcat is much more adapted to the Holocene world than the European wildcat ever was. It is more than at home in agrarian landscapes, and it does well in urban environments too. This story sort of parallels our own species, which came out of Africa into the land of the Neanderthals. We exchanged genes, but our species eventually swamped the land. Maybe we will have better DNA studies of cats. Maybe we’ll find that European and European-derived domestic cats have traces of European wildcat ancestry. One should have little hope for the pure European wildcat existing in Scotland or anywhere else where it currently roams, but maybe if we’re okay with the simple fact that hybridization exists, we can preserve what looks and behaves like a wildcat– and not worry too much about its DNA. Last night, I came across a link about how conservationist were now using DNA tests to determine if certain tabby cats in Scotland were pure Scottish wildcat or not. I thought it was pretty interesting, but I do have some issues with how this particular question is being framed. My biggest problem is the assumption that Scottish wildcats are a distinct subspecies from the European wildcat. If that’s the case, then they are doomed anyway. There likely isn’t enough genetic variation within the endemic Scottish population for them to be maintained as a “pure” subspecies. European wildcats (Felis silvestris silvestris) are found somewhat healthier numbers on the continent. They aren’t exactly thriving, but they aren’t almost extinct like the Scottish population. 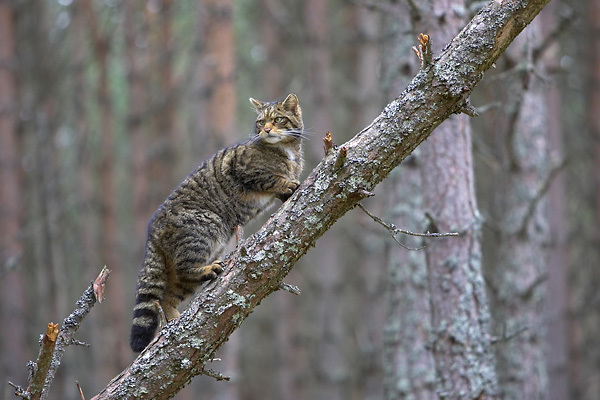 These wildcats, especially those in Eastern Europe, which still roam the forested terrain, could be used for genetic rescue. The real problem, though, is that these cats are being swamped with lybica wildcat genes. The lybica wildcat, which unfortunately has been given the vernacular name of “African wildcat,” even though it is also found in the Middle East, is the progenitor of the domestic cat. Many sources list this cat as being a distinct species– usually as Felis catus or Felis domesticus-– but the current trend is to call it Felis silvestris catus. I don’t think it has evolved that much from its wild ancestor, so I think it is much more appropriate to keep it as F.s. lybica. The lybica wildcat has proven to be quite successful at living in agricultural areas. These animals have spent thousands of years freely breeding around agricultural enterprises, and they are easily the most successful of all carnivorans living today. Domestic cats are found everywhere, and because they have the ability to breed freely and rapidly without human assistance, their worldwide numbers must be much higher than those of domestic dogs. The European subspecies is much more adapted to forested habitats, and as a result, they haven’t done very well since the rise of agrarian man. These two animals are different subspecies that have adapted to two very different niches. Raymond Coppinger’s main contention that dogs are a different species from the wolf is that wolves and dogs occupy different niches, but I’ve always thought that was a terrible argument. These two wildcats clearly have two different niches, but it is obvious that they aren’t distinct species at all. And this, of course, causes a major issue. Lybica wildcats are very well adapted to living in human influenced environments. And as a result lybica genes are swamping the European wildcat population. This problem isn’t just happening in Scotland. It is happening all over the European wildcat’s range. Which brings us to a very important question: Can the European wildcat be saved as a “pure” subspecies? In order to preserve as pure, one would have to set aside vast tracts of forested land and then trap out every domestic cat that comes within ten miles of the preserves. This is exactly the same procedure that the red wolf conservationists are using. Of course, the red wolf’s exact taxonomic status is very dodgy, but the so-called “pure” red wolves readily mate with Eastern coyotes that wander into their range. The only way to keep them “pure” is to spend lots of time and energy trapping coyotes that show up near red wolves. Cats are much harder to control than coyotes, and there is also a much larger constituency of “cat protectors” who don’t want anyone doing anything to them. So my guess is that it would be very hard to implement any program to control domestic cats in European wildcat range. And then, while you’re keeping them “pure,” you’re going to have to think about genetic rescue at some point. Are all the European wildcats the same subspecies? If not, then some of these proposed subspecies are simply doomed. The truth is all wild and freely breeding populations are constantly in flux. That’s the way it’s been with humans, and that’s the way it was with dogs until the closed registry system became institutionalized. Virtually all black wolves living today are black because of a mutation that originated in domestic dogs. The mutation was introduced to wolves through crossbreeding. This melanistic trait is believed to have some selective advantage in boosting the immune system, which may be one reason that the historic wolf population of Florida consisted almost solely of black individuals. This trait never would have been passed on had two subspecies not exchanged genes at some point. Maybe domestic cats can offer European wildcats some beneficial genes. At the very least, they might offer them new MHC haplotypes, which would be very good for such an inbred population. But if the goal is to keep European wildcats pure, it’s mostly a fool’s errand. The lybica wildcat in its domestic form is just too successful.